A boutonniere (say "boo-tuh-NEER") deformity is an injury to the tendon that runs over the middle joint of a finger. The injury causes the middle joint to bend down and the end joint to bend up. When you have this injury, you can't straighten your finger. "Boutonniere" is French for "buttonhole." 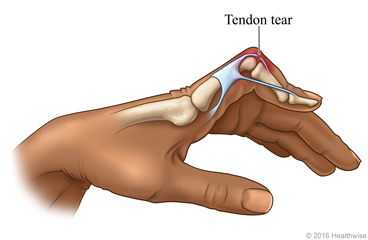 The injury often causes an opening in the tendon that looks like a buttonhole. It can also be caused by rheumatoid arthritis, which causes pain, stiffness, and swelling in the joints. Your doctor may try using a splint to see if the injury heals. If a splint doesn't work or there are other problems, your doctor will talk to you about surgery. Surgery involves making a cut in the skin over the joint and fixing the tendon. You will probably be able to go home after the surgery. Your doctor may put a splint on your hand or finger after the surgery. If so, wear it exactly as directed. Do not remove it until your doctor says that you can. Follow-up care is a key part of your treatment and safety. Be sure to make and go to all appointments, and call your doctor or nurse call line if you are having problems. It's also a good idea to know your test results and keep a list of the medicines you take. You may be referred to rehabilitation or hand therapy. If you take aspirin or some other blood thinner, be sure to talk to your doctor. He or she will tell you if you should stop taking it before your surgery. Make sure that you understand exactly what your doctor wants you to do. You may get medicine that relaxes you or puts you in a light sleep. The area being worked on will be numb. The surgery will take about 90 minutes. Enter O426 in the search box to learn more about "Boutonniere Deformity: Before Your Surgery".